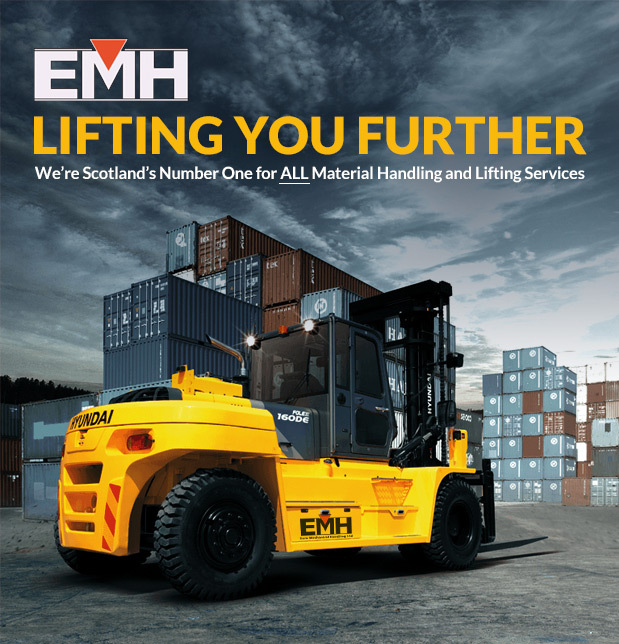 Euro Mechanical Handling Ltd (EMH) are an independent Scottish Material Handling company, that specialises in Forklift Trucks, Telehandlers, Lifting Equipment compliance/proof load testing and Training. We are proud to be the premier Hyundai Forklift Trucks distributor for forklift trucks in Scotland. We offer the most comprehensive range of Materials Handling Equipment in the market place, which also surpasses the strictest EU emission regulations and standards. Our expertise is not limited simply to forklift trucks, we are able to supply and maintain a variety of equipment such as Attachments, Hand Pallet Trucks, Sweepers, Loaders, Telehandlers, Access Equipment and much more. Our Lifting Services division not only deliver the largest choice of lifting equipment stock direct to our customers but also provide peace of mind that they are operating in a safe environment by undertaking LOLER compliant Examinations, Load Testing and Inspection. All certification is instantly available on our web based portal EUROCERT. As one of the world’s largest manufacturers of engineering equipment, Hyundai is widely recognised as an industry leader due to their advanced ergonomic engineering and technology. Hyundai offers a full range of forklift trucks. Diesel, LP Gas and Electric counterbalanced machines plus a full range of warehousing equipment including pedestrian / ride-on Power Pallet Trucks, Reach Trucks and Order Pickers. Find out more here. Euro Mechanical Handling (EMH) was formed in 2009 and has quickly established themselves as leading independent provider of Forklift Trucks and services in central Scotland. EMH also benefits from being part of the ZL Group of companies, so are able to offer customers solutions in Transport, Warehousing & Distribution, Powered Access and Training. As dedicated specialists in lifting and material handling, EMH launched a new lifting equipment Testing and Inspection division in 2017 to further enhance the variety of solutions already being provided to customers. 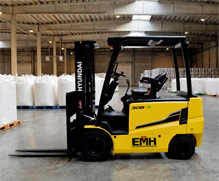 In order to ensure customers are continually provided with the most comprehensive equipment in the market and excellent customer service, EMH entered into successful negotiations to become the premier distributor for Hyundai Forklift Trucks in Scotland commencing in March 2018. With a dedicated Training Centre, through our sister company Active Access, EMH can not only offer RTITB and ALLMI Certificated training courses but also a variety of connected disciplines such as Health & Safety Awareness and First Aid. As one of the world’s largest engineering manufacturers, Hyundai is widely recognised as an industry leader due to their advanced ergonomic engineering and technology. 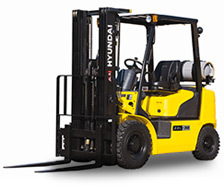 Hyundai offers a full range of forklift trucks. Diesel, LP Gas and Electric counterbalanced machines plus a full range of warehousing equipment including pedestrian / ride-on Power Pallet Trucks, Reach Trucks and Order Pickers.